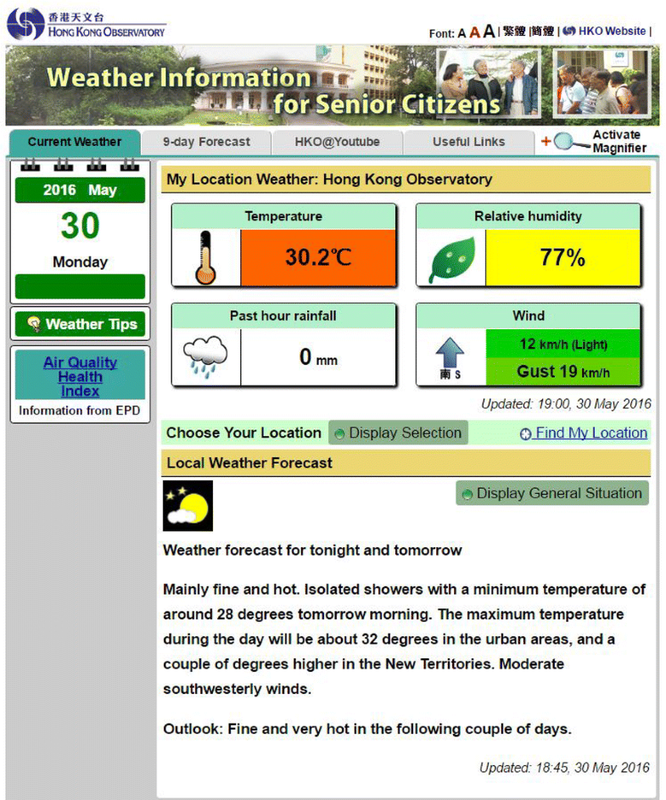 Under the relentless pace of population growth and urban development, weather and climate services provided by the Hong Kong Observatory (HKO) since its establishment in 1883 have been evolving continuously with an increasing focus on the delivery of tailored information to meet the needs of special users and various stakeholders in the community. With meteorological observations at the headquarters of the Observatory dating back more than 130 years to 1884, the advent of automatic weather station network in the mid-1980s has significantly expanded the data coverage both in terms of spatial and temporal resolution. The establishment of the Community Weather Information Network in 2007 further extended the meteorological measurement to the school and community levels. Regular upper air soundings and the increasing availability of remote-sensing observations also enable the monitoring of meteorological parameters beyond the near-surface levels through the depth of the atmosphere. By integrating comprehensive weather observations and numerical weather prediction products, HKO now provides a wide range of forecasts covering multi-time scales and warnings and advisories for high-impact weather such as tropical cyclone, thunderstorm, heavy rain, landslide, flooding, and cold and very hot weather. Riding on the advances in communication technology in recent decades, members of the public have gained improved access to the latest weather warnings, advisories, weather information, and forecast for the next couple of hours to 9 days ahead, as well as forecasts near users’ locations through HKO’s website and mobile app. In addition to information for public consumption, HKO’s services and products have been tailored in support of weather-sensitive operations such as those provided to users in the aviation and marine communities. In the process of such diversified development, HKO has successfully cultivated close partnerships with various stakeholders to enhance its weather and climate services by embracing the spirit of the Big Data and smart city concept in recent years, in particular in areas related to energy, water, health, and disaster risk reduction. In this paper, a review of the weather and climate services focusing on the urban aspects in Hong Kong will be presented, with examples illustrating specific applications in different sectors. Future thrusts in enhancing and integrating the urban weather and climate services for Hong Kong in the Big Data era under the Climate Friendly Demonstration City initiative and impact-based forecast approach promulgated by the World Meteorological Organization will also be discussed. With more than half of the global population now living in cities, the United Nations adopted the New Urban Agenda in 2016 to set a new global standard and roadmap for sustainable urban development, including the actions to address climate change and strengthen the resilience of cities for reducing the risk and impact of natural disasters (United Nations 2016). In response to this, the WMO considers the cross-cutting urban focus as one of its priorities for meteorological community and encourages a novel approach of integrated urban weather, environment, and climate services for sustainable development and multi-hazard early warning systems in cities (Baklanov et al. 2017). Moreover, urban activities related to climate are also included as a specific cross-cutting element within the priority areas of the WMO global framework for climate services (e.g., health, energy, disaster risk reduction, water, etc.) (WMO 2017). Hong Kong, situated along the southeastern coast of China and over the eastern part of the Pearl River Delta (PRD), has developed from a trading port in mid-19th century into a modern and highly urbanized metropolitan coastal city with about 7.4 million people today. While Hong Kong has a total area of about 1104 km2, owing to its mountainous topography with steep slopes over 20% of the total land area, most of the urban activities are concentrated on built-up areas that take up about 24% of land (DEVB and PlanD 2017). Hong Kong has a sub-tropical climate. Tropical and mid-latitude weather systems together with summer and winter monsoons give rise to a wide variety of weather in Hong Kong. Generally speaking, it is hot and humid in summer, and cool and dry in winter. Severe weather phenomena that can affect Hong Kong include tropical cyclones, heavy rain, severe thunderstorms, extreme high temperatures, and cold surges. Against the background of global climate change and local urbanization, Hong Kong has experienced significant changes in climate in the last century, including long-term warming trend, rising sea level, more frequent extreme weather, etc. (e.g., Lee et al. 2010b; Wong et al. 2011). Looking into the future, Hong Kong can expect even warmer weather, more variable rainfall, more frequent extreme weather, and a sea level that keeps rising (HKO 2017a). Although Hong Kong is a highly modernized city with robust infrastructure, it does not make the city immune from the impacts of climate change. The likely increase in the frequency and severity of extreme weather and related hazards in the coming decades (e.g., heavy rain, flooding, landslide, extreme high temperature, and typhoon-induced storm surge) may disturb and interrupt the socio-economic activities of the city and post a great challenge to the future infrastructure design and sustainable development of the city. Moreover, riding on the upsurge of “Big Data”, “the Internet of Things”, and “Smart City” concepts in recent years, meteorological information have become integral parts of the mountain of data to be analyzed and utilized. It is envisioned that the society would make wider use of various meteorological data and products for better public services and sustainable social and economic growth (Shun and Chan 2017). Established in 1883, HKO is the meteorological authority responsible for monitoring and forecasting weather, issuing warnings on weather-related hazards and providing climate services in Hong Kong, amongst others. Over the years, the weather and climate services provided by HKO have been evolving continuously with a view to offering people-oriented quality services to meet the increasing need of special users and various sectors in the community and to enhance the society’s capability in natural disaster prevention. This paper reviews the latest weather and climate monitoring networks in Hong Kong, and gives an overview and examples of the wide range of weather and climate services for the city development and urban activities in Hong Kong. Future thrusts in enhancing and integrating the urban services for climate friendly development of Hong Kong in the Big Data era are also highlighted. With the setting up of its first observational post-way back in 1883, HKO has been making various meteorological measurements for over 130 years at its headquarters (Lee 2016). It is also one of the WMO recognized Centennial Observing Stations (WMO station code: 45005) in Asia with over a century of continuous observations of essential surface meteorological observations, such as temperatures, rainfall, pressure, and relative humidity (HKO 2017b). These serve as a valuable basis for its climate research and services as well as key references for establishing the climatology in Hong Kong. The long-term meteorological observations since 1884 also document the climate variations in Hong Kong through time due to global climate change impact and local urbanization effect, thereby providing an invaluable source of climate information not only for Hong Kong but also for the world. Since the mid-1980s, the advent of the automatic weather station (AWS) network currently with 87 AWSs has further expanded in areal coverage and enhanced the temporal resolution of meteorological observation in Hong Kong (Fig. 1). Moreover, to cope with the landslide and flooding risks, rainfall observation is greatly enhanced by the implementation of 28 and 90 automatic rain gauges, respectively, by the Drainage Services Department (DSD) and Geotechnical Engineering Office (GEO) of the Civil Engineering and Development Department (CEDD) in the last couple of decades. The real-time weather data from the AWSs assist forecasters in closely monitoring changes in weather conditions in different parts of the territory and, if necessary, issuing weather warnings in good time during increment weather situations. The AWS data also support various location-specific weather services offered by HKO’s website and “MyObservatory” mobile app. Regular upper air soundings have been conducted manually at King’s Park Meteorological Station (KP, WMO station code: 45004) since the 1950s. KP is one of the long-term stations in the GCOS Upper Air Network of WMO which currently is equipped with an upper air sounding system capable of automatic balloon launching. Currently, regular upper air soundings of temperature, wind speed/direction, pressure, and humidity are made two times a day at 00 and 12 UTC at KP (Wong and Yu 1998). Moreover, KP conducts sunshine duration, solar radiation, UV, potential evapotranspiration, and evaporation measurements. In addition to upper air soundings at KP, various remote-sensing measurements are implemented to monitor the meteorological conditions beyond the near-surface levels through the depth of the atmosphere, including five Doppler weather radars, four wind profilers, two microwave radiometers, three Doppler LIDARS (light detection and ranging), four units of SODARs (sonic detection and ranging), satellite reception systems receiving data from 19 meteorological satellites, and a lightning location network. Weather radars and satellite images are important tools for monitoring severe weather such as thunderstorms, squall lines, and rainstorms in the vicinity of Hong Kong as well as the movement and structure of tropical cyclones. The real-time weather radar information is also utilized together with data of rain-gauge networks in nowcasting of rainstorms and support of relevant warning services (Woo and Wong 2017). In particular, the Hong Kong International Airport (HKIA) is among the first airports to implement LIDAR systems for the detection of low-level windshear for safeguarding aviation safety (Shun and Chan 2008). The lightning location network comprises seven stations jointly established by HKO, the Guangdong Meteorological Bureau and the Macao Meteorological and Geophysical Bureau, covering lightning detection around PRD (HKO 2017c). Lightning information, including lightning stroke timing, location (latitude and longitude), stroke type (cloud-to-cloud or cloud-to-ground lightning), polarity and peak current, waveform rise, and fall time are updated every minute for the reference of the weather forecasting and nowcasting services (Lee 2009; Lee et al. 2014). HKO developed in-house a set of heat stress monitoring system which automatically measures the dry bulb, natural wet bulb, and globe temperatures in Hong Kong. The data collected by these temperature sensors are used for computing Hong Kong Heat Index (Lee et al. 2016) catering for the climate and environment of Hong Kong in support of HKO’s services related to hot weather (Fig. 2). Since the 1950s, a number of automatic tide gauges were installed along the coast of Hong Kong. The measurements obtained are useful for tidal predictions, real-time monitoring of storm surges and tsunamis, as well as tracking long-term sea-level changes (Ip and Wai 1990; Lee and Wong 2007; Lee et al. 2010a). Moreover, the tide measurements of the Observatory are supplied to the University of Hawaii Sea Level Center and the Permanent Service for Mean Sea Level (PSMSL) to support long-term mean sea-level monitoring. Efforts have been made by HKO since 2007 to implement the Community Weather Information Network (Co-WIN) through the joint cooperation with the Hong Kong Polytechnic University (PolyU) and the Chinese University of Hong Kong (CUHK). Co-WIN encourages schools and community groups to install and operate low-cost AWS at their own premises at their own costs, with professional advice and assistance provided by HKO, PolyU, and CUHK (Lee et al. 2012b; Tam and Ong 2012). 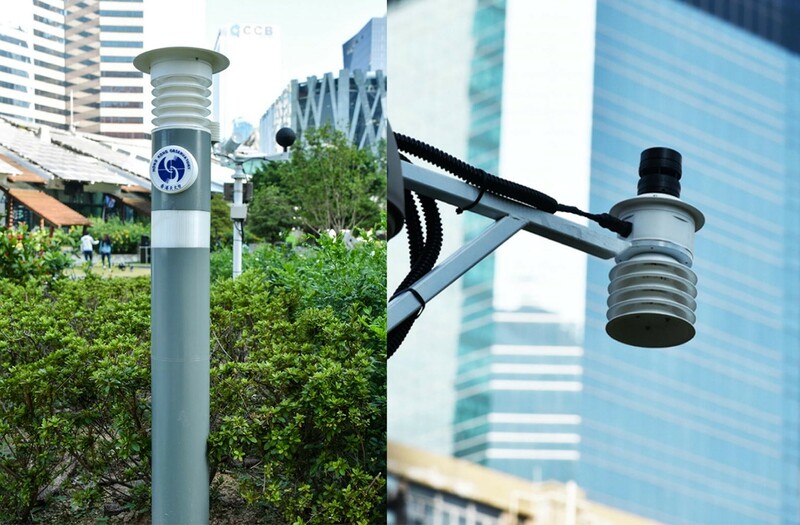 Weather elements measured include air temperature, relative humidity, wind direction and wind speed, air pressure, and rainfall amount, while some members also have installed additional sensors for measuring solar radiation and ultraviolet radiation. Minute-to-minute data are transmitted in real time over the Internet and displayed on the Co-WIN website after some automatic quality checks (Fig. 3, Co-WIN 2017). As of the end of 2016, Co-WIN has recruited around 160 members, including primary and secondary schools and other organizations. The meteorological observations collected in Hong Kong are compiled and published regularly for monitoring the monthly, seasonal, and annual climate status in Hong Kong. As El Niño and La Niña conditions could have effect on the monthly and seasonal climate of Hong Kong against the ENSO-neutral situation from a statistical perspective (Lee and Cheng 2011), the latest status and forecast of the warming and cooling of surface waters over the central and eastern equatorial Pacific Ocean are also closely monitored and reported in the HKO website for public reference. Long-term variations of various meteorological elements and indices, such as temperature, rainfall, sea level, tropical cyclone frequency, and extreme weather events, are also conducted to assess the climate change in Hong Kong due to global warming and local urbanizations (Lee et al. 2010b; Wong et al. 2011; Chan et al. 2012). By integrating comprehensive weather observations and numerical weather prediction model products, HKO provides a wide range of forecasts covering multi-time scales (ranging from nowcasting, 9-day forecast, seasonal prediction, and climate projection) and different spatial resolution in Hong Kong. Moreover, warnings and advisories for various hazards (e.g., tropical cyclone, thunderstorm, heavy rain, landslide, flooding, cold and very hot weather, etc.) have been in place to reduce loss of life and damage to property. The weather and climate services with an urban focus are summarized in the following paragraphs. Tables 1 and 2 also summarize the types of key weather and climate services, public communication approaches, and stakeholders engaged for easy reference. HKO operates around-the-clock to closely monitor weather changes, and provides detailed weather forecasts to the members of the public and different sectors of the society, ranging from the next couple of hours to 9 days ahead. Warnings are issued whenever Hong Kong is threatened by severe weather conditions such as tropical cyclones, rainstorms, thunderstorms, and very hot or cold weather. Moreover, HKO provides special weather tips on HKO’s “MyObservatory” mobile app and website to alert the public of the approach of inclement weather. To help members of the public to plan further ahead, HKO launched the “Extended Outlook” featuring probabilistic forecast of maximum and minimum temperatures up to 14 days ahead and the tropical cyclone track probability forecast up to the following 9 days in 2017 (HKO 2017d, e). On the service quality aspect, HKO’s weather forecasting and warning services are certified to ISO 9001:2015 Quality Management Systems (HKO 2017f). The weather forecasting and warning services of Hong Kong are fully supported by various in situ meteorological observations, state-of-the-art numerical weather prediction (NWP), and nowcasting products. In addition to the NWP products from major global NWP models, by adopting JMA-NHM (Saito et al. 2006), HKO developed a rapid update non-hydrostatic modeling system for mesoscale weather forecasting with horizontal resolutions of 10 km initialized by 3-hourly analysis, and of 2 km using hourly update cycle incorporating weather radar data for convective-allowing simulations (Wong 2011). Moreover, HKO’s Aviation Model (AVM; Wong et al. 2013; Chan and Hon 2016), which is based on WRF-ARW system (Skamarock et al. 2008), providing hourly updated model forecasts at horizontal resolutions of 600 and 200 m. Regarding quantitative precipitation estimation (QPE) and quantitative precipitation forecast (QPF) for the next few hours, an in-house developed rainstorm nowcasting system called Short-range Warnings of Intense Rainstorm of Localized Systems (SWIRLS) has been operating to support rainstorm-related high-impact weather services for public and specialized users (Li et al. 2014; Woo and Wong 2017). Using post-processed outputs from state-of-the-art NWP models, location-specific weather forecast for the next 9 days has been made available to the public in recent years through the Automatic Regional Weather Forecast (ARWF) service. ARWF provides hourly forecasts of temperature, humidity, wind speed and direction, and the daily chance of precipitation at users’ selected locations. These ARWF products together with nowcast products for rainfall and lightning are available from HKO’s “MyObservatory” mobile app and GIS website (Fig. 4) to offer convenient weather services for the public at their fingertips. Through special arrangements, HKO provides tailor-made meteorological support for weather-sensitive users, such as major sporting events and festival activities (e.g., 2008 Beijing Olympic Games (Jeffcott et al. 2009) and New Year fireworks display). Depending on the need of the users, tailored web-based products, telephone consultation, and notification of alert message can be arranged. Pre-wet season seminars, training courses, briefings, and visits are conducted for relevant government departments and weather-sensitive stakeholders to promote their awareness of, and community preparedness for, natural disasters. HKO also provides meteorological services for both aviation and marine communities. HKO’s Airport Meteorological Office, via web-based Aviation Meteorological Information Dissemination System (AMIDS), provides weather information for HKIA and the Hong Kong flight information region (HKFIR) in support of international aviation navigation. The marine meteorological information and forecasts provided by HKO have the functions of serving international shipping on the high seas, fishing in coastal waters, and local water transport and recreation offshore. With a view to enhancing the effectiveness of the weather warnings and ensuring the smooth operation of the society, close liaison is maintained with relevant government departments and public utilities during inclement weather (SB 2015). Drills and exercises are also conducted to familiarize relevant parties with the procedures or contingency plan to handle tropical cyclone and rainstorm situations, and to test the communication protocol and links. Various weather information, forecast, and warnings of HKO are timely disseminated to the general public, government departments, marine community, and other specialized users through different channels, including media (TV, radio, and newspaper), Dial-a-Weather service, webpages, mobile platforms, and social media. In particular, the online information service and location-specific weather services offered by HKO’s “MyObservatory” mobile app and website (HKO 2018) allow urban dwellers to access various first-hand weather information anywhere and anytime (Fig. 5). The app also instantly notifies users about typhoon and rainstorm signals that affect school and work and special weather tips of upcoming storms and imminent threat of heavy rain. The app is also equipped with “location-based rain nowcast” service that employs state-of-the-art technology based on SWIRLS to tell users when and where the rain will start and stop (Fig. 6). 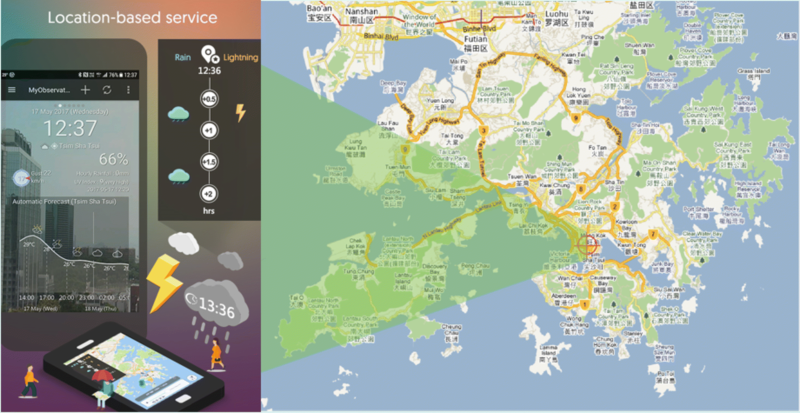 To alert people engaging in outdoor activities of approaching thunderstorms, a location-based lightning nowcast service capable of alerting users of lightning in the upcoming 60 min was also launched on the mobile website in March 2017 (HKO 2017g). The HKO website and the “MyObservatory” mobile app have attracted more than 167 billion page views in 2017, while the total number of downloads of the mobile app has exceeded 6.7 million. Television remains one of the most popular channels for the general public to receive weather information in Hong Kong, and HKO has been producing weather programmes hosted by HKO’s meteorologists in collaboration with local TV networks since 1987. Besides the regular morning and evening TV weather programmes, weekly educational TV programme series called “Cool Met Stuff” (CMS) covering a diversity of topics ranging from weather, climate, climate change, and earth sciences to astronomy are also produced (Yeung and Song 2016). Videos of all TV programmes produced by HKO are also available on YouTube, accessible through the “MyObservatory” mobile app and promoted through social media platforms (HKO 2017h). In collaboration with Radio Television Hong Kong, HKO has jointly produced the award-winning TV documentary “Meteorology Series IV” which looks into the underlying causes and impact of extreme weather phenomena in the context of climate change. With the increasing popularity of social media, HKO launched a thematic Facebook group named “Community Weather Observing Scheme” (CWOS) as a platform for sharing photos of the sky and atmospheric phenomenon taken by the public (CWOS 2017). The Facebook group also effectively promotes meteorological knowledge to the public. A number of weather photos gathered on the Facebook group were included in the new version of International Cloud Atlas issued by WMO. By utilizing various meteorological observations in Hong Kong, HKO has been providing different sectors of the community with a full range of climatological information services, including data quality control, maintaining climate statistics and extreme records, provision of climate data for public and government departments, and compilation of data summaries and weather reviews. HKO has also set up the Climatological Information Services webpage (HKO 2017i) which provides one-stop-shop online access to more than 130 years of climate data of Hong Kong, the latest climate news, and educational resources on climate subjects. HKO has been working closely with different engineering departments and professional bodies to establish and regular review the engineering design standards and codes of practices appropriate to local conditions for protecting the city and public safety against various weather hazards and natural disasters. Some examples include the code of practice on wind effects (BD 2004) to ensure that local buildings were strong enough to withstand hurricane force winds, a threat brought about by the occasional passage of typhoons; the estimation of the extreme rainfall return periods and probable maximum precipitation for the formulation of slope safety measures and the design of drainage system with sufficient capacity to prevent flooding for the city due to rainstorms, and the anticipated highest sea level, taking into account the tidal cycle and storm surge brought by typhoons as well as future sea-level rise for incorporation in the Port Works Design Manual for designing port, reclamation, and coastal engineering facilities to protect the city from sea flooding (CEDD 2002). Given that weather conditions have impacts on public health. HKO has been studying, in collaboration with other government departments, tertiary institutions, and social enterprises, the impact of weather on public health in Hong Kong with a particular focus on thermal stress and the occurrence of infectious diseases. Some examples include the following. HKO collaborated with microbiologists of CUHK to study the seasonal variations of the occurrence of influenza in Hong Kong. The study identified the favourable climatic conditions for the occurrence of seasonal peaks of the influenza in Hong Kong, and provided useful information on the timing and duration of the application of vaccinations for protecting the public and the scientific basis for further research on relevant predictive models (Chan et al. 2009). To enhance the heat stress information services in Hong Kong, HKO and CUHK collaborated in a study to develop the Hong Kong Heat Index (HKHI) for use in hot and humid sub-tropical climate in Hong Kong using hospitalization data and heat stress measurement data in Hong Kong. Based on the study results, two reference criteria of HKHI were identified to establish a two-tier approach for the enhancement of the heat stress information service in Hong Kong (Lee et al. 2016). The previous studies suggest that thermal stress under cold and hot weather conditions is strongly linked with higher mortality and hospitalization rate in Hong Kong, particularly among the elderly. With a view to providing better care for the elderly people in Hong Kong, in recent years, HKO has been working closely with the Senior Citizen Home Safety Association (SCHSA), a self-financing and not-for-profit organization which provides a 24-h personal emergency support and caring service to elderly citizens in Hong Kong, to enhance care services through the utilization of weather and climate information, including the study of health impact of weather and climate on senior citizens (Mok and Leung 2009; Wong et al. 2015). Services provided and activities organized include: a new version of HKO’s “weather information for senior citizen” webpage (Fig. 7), enhancement of SCHSA’s “e-See Find Service” application with real-time weather information, annual joint press conferences to promote proactive and timely assistance for the elderly when cold weather is expected, and the “Sky of Silver Age” weather photo-competition and workshops to encourage the elderly people to adopt a wholesome outdoor lifestyle by maintaining an active interest in the weather that affects them. The decade long collaboration between HKO and SCHSA in utilizing climate information for elderly caring services has also been documented as one of the 40 case studies in the WMO–WHO Joint Climate and Health Office publication on “Climate Services for Health—Case Studies” (Lee and Leung 2016). The dense development in a crowded city like Hong Kong may have significant impacts on the urban climate (e.g., urban heat island effect, lower wind speed, etc. ), resulting in uncomfortable habitat and increase in energy consumption. To help mitigate these negative effects and improve the quality of living environment through integrating climatic considerations in urban planning and design, HKO has been providing meteorological data and expert advice for planning department and its consultants as well as other professional bodies [e.g., Hong Kong Green Building Council (HKGBC)] to establish guidelines to assess and regulate the impact of potential city, community, and building developments on air ventilation and micro-climate (HKGBC 2017). Furthermore, urban climatic maps have been drawn up through analyzing and evaluating climate data together with different geometric and urban development data (e.g., land use, building density, and topography), to classify Hong Kong into different urban climatic zones, each with recommended planning and development actions (PlanD 2008). Energy saving has been a worldwide trend in combating global climate change, and the Hong Kong Government has taken various initiatives to promote energy efficiency and conservation. 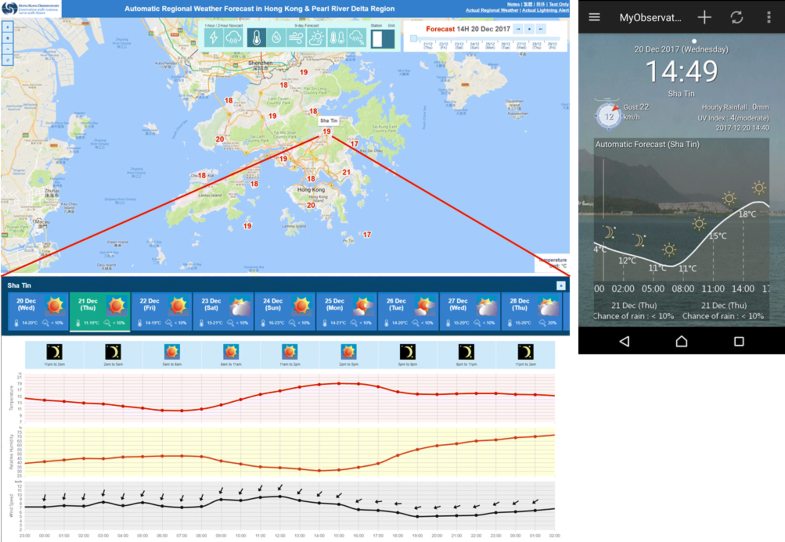 In support of the initiative, HKO and CLP Power Hong Kong Limited (CLP) join hands to enhance the “Meter Online Service” of the CLP Power to include the “9-day Energy Forecast” which utilizes the 9-day weather forecast provided by the Observatory. The energy consumption forecast allows property management to plan ahead energy saving measures to reduce the electricity consumption and peak loading under hot weather situation with significant results (Cheung et al. 2016). The two main sources of fresh water supply in Hong Kong are rainfall collected from local catchments and water imported from the neighbouring province Guangdong of mainland China, with the latter supplying about 70–80% of local demand. Agreement has been made between the water authority in Hong Kong (the Water Supplies Department, or WSD) and its Guangdong counterpart to secure a reliable and flexible supply of water to meet actual needs of Hong Kong. To support water resource management, HKO has been providing monthly forecast of yield collected in Hong Kong reservoirs to WSD since 2010. Verifications showed that the yield forecast is generally a better reference than climatology, demonstrating the benefits of climate prediction for managing water resources in Hong Kong (Lam and Lee 2012). 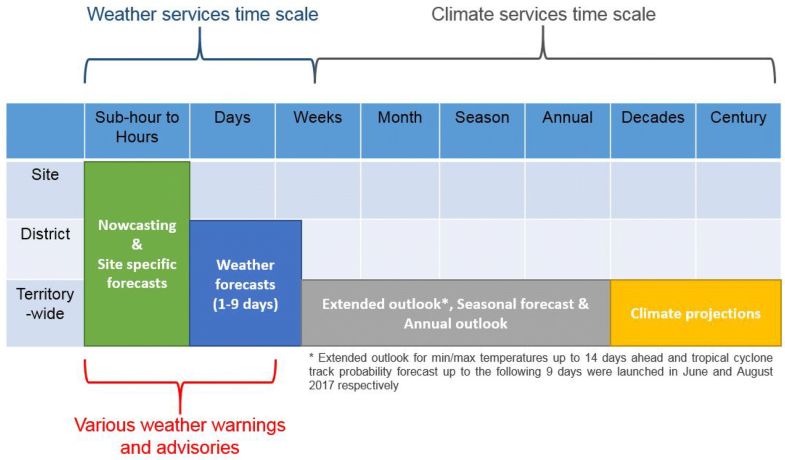 Seasonal forecasts for the average meteorological condition of a month to about a year ahead are useful for government, business, and industry alike to enhance productivity, maximize economic benefit and minimize loss. HKO adopts an ensemble approach to formulate its climate predictions in Hong Kong (Chang and Yeung 2003; Lee and Cheng 2011; Chan and Lee 2015; Tong et al. 2016) using long-range model forecast products from major climate prediction centres and the global-regional climate model (G-RCM) operated in house as well as the latest forecasts for the ENSO status. Seasonal forecasts of average temperature and total rainfall and annual outlook of tropical cyclone activity and rainfall in broad terms are prepared and made available online for users’ reference (HKO 2017j). Climate change has become a major challenge of our time. To inform the public and stakeholders of possible climate change impacts and support future planning, a number of studies have been conducted to examine the past changes and project the future trend in local and regional climate and related extreme weather events due to global climate change and local urbanization (e.g. Ginn et al. 2010; Chan et al. 2012; Lee et al. 2011, 2012a; He et al. 2016). In particular, climate projection of temperature, wet-bulb temperature, rainfall, and mean sea level in Hong Kong are computed based on IPCC climate model data. The projection results are also available online (HKO 2017a). HKO also, on a regular basis, organizes a climate research forum, and interacts with experts and researchers from local universities to discuss climate prediction and projection techniques and keep abreast of the latest development of climate science and explores with partners opportunities to apply research results for the benefits of the society. To promote public awareness on climate change issues, HKO collaborates with government departments and organizations to deliver school talks with topics extending from the scientific basis of climate change to energy saving and efficiency, biodiversity conservation, climate change mitigation, adaptation, and resilience. HKO has also published a climate change pamphlet “Hong Kong in a warming climate” and operates a thematic website which provides regular updates on the latest development of climate change. In 2016, HKO took the lead in coordinating with other government departments and organizations to organize the “Climate Change—Our Response” roving exhibition to showcase how different sectors in Hong Kong could work together to build a low-carbon and sustainable society in three main aspects namely mitigation, adaptation, and resilience (HKO 2016). HKO has also actively provided scientific input and technical support to the government-wide Steering Committee on Climate Change, as well as the publication of key documents such as “Hong Kong Climate Change Report 2015” and “Climate Action Plan 2030+” (ENB 2015, 2017) on climate change policy issues prepared by the Environment Bureau. With the continuous enhancement of weather monitoring networks, the development of higher resolution models, and launch of new generation of meteorological satellites, the growth of the meteorological big data has been going on relentlessly, and, indeed, at a highly rapid pace (Jiao 2016). Moreover, the implementation of the big data and smart city initiatives opens new opportunities for meteorological services synergized with different stakeholders to access more weather-related impact data (e.g., weather event photos from public, tree failure and flood reports, road and air traffic data, health impact data, etc.). The advancement in big data analytics and machine learning techniques also enable the feasibility of automatically and intelligently integrating meteorological and non-meteorological data in weather analysis and forecasts and help to understand user’s needs and responses (Shun and Chan 2017). Looking into the future, a number of initiatives and pilot projects are in the pipeline for enhancing the urban weather and climate services in Hong Kong in the big data era. Two main thrusts, namely the pilot project on new urban weather monitoring system and the development of impact-based and risk-based weather service, are outlined in the following paragraphs. Table 3 also highlights the salient changes from present to future as well as potential benefits arising from these two initiatives. To support enhancement of urban weather services, urban planning, and various urban research as well as the implementation of the Big Data and smart city initiatives, high-density in situ weather observations in the urban areas of Hong Kong are needed. 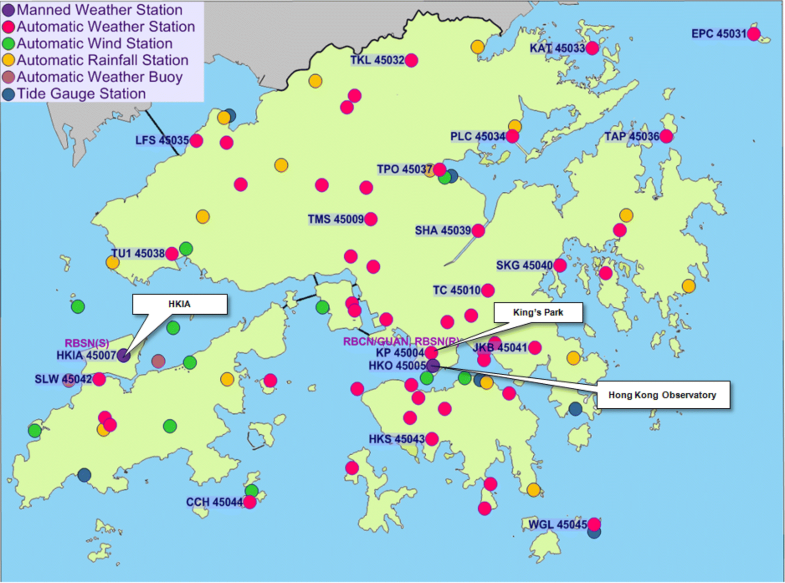 However, due to various limitations and challenges, the number of urban scale weather stations is still relatively small when compared with the conventional stations currently deployed in Hong Kong which are mostly geared towards the collection of weather information at stringently selected and well-exposed sites (hence very often in more remote areas away from built environment) following internationally agreed standards and procedures. 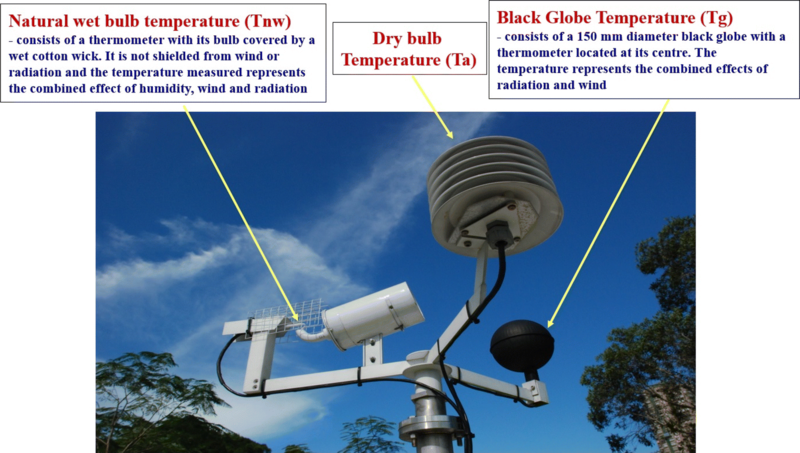 With new and emerging weather sensors, communication, and Internet of Things (IoT) technologies, relatively low cost and low power feasible solutions are now available to integrate and increase the density of meteorological observations in urban areas. HKO plans to collaborate with academia and other stakeholders (e.g., Co-WIN) to conduct a pilot project to develop a new experimental real-time urban weather monitoring system which is suitable for the climate and high-density urban environment of Hong Kong (Fig. 8). A data-sharing platform will also be developed in support of the smart city and Big Data initiatives and other potential applications including urban planning, building design, fine-resolution meteorological analysis and modeling, urban weather services, urban micro-climate research, and health impact studies. Moreover, research studies will be conducted to integrate the collected data in post-processing the computer model forecast for developing next-generation urban scale personalized automatic weather forecasts, and integrated in the fine-resolution weather models and other related forecasting systems to facilitate the development of multi-hazard impact-based forecasts and warnings for the city. Like many other metropolitan cities in the world, traffic congestion is a common problem in Hong Kong during rush hours and rainy weather. However, the impact of rainfall on road traffic may not be the same at different regions or districts. To have a better understanding of this with an aim to predicting traffic speed reduction due to rain, HKO joins efforts with other government departments to launch a study using Big Data analytics. By correlating the historical rainfall amount with traffic speed on some major routes, a brief relationship would be established. A predictive model will be built to quantitatively determine how much the traffic speed will be affected given that a certain amount of rainfall is anticipated. 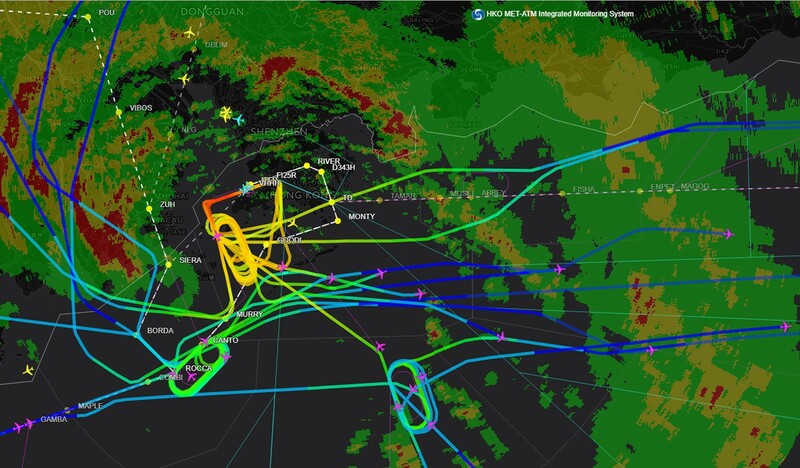 Under significant convective weather, pilots and air traffic controllers have to make time-critical decisions to reschedule or direct aircraft to avoid severe convection to maintain safety and ensure air traffic efficiency (Fig. 9). The convective weather can also lead to a significant safety impact to airport ground operation, reduction of airport capacity, increase in fuel consumption, and flight delays. HKO has embarked on a research project with an objective to uncover the hidden relationship between meteorological, aircraft, and airport traffic data using Big Data approach. The outcome may enable automatic nowcast for a few hours ahead of the evolution of atmospheric convections as well as their impacts over the airport and nearby airspace. The goal is to achieve safer and more efficient air traffic operations, and, hence, reduce operational costs, shorten flight delays, and to be environment-friendly with less fuel consumption. Against the background of global climate change and local urbanization, the impact of weather on public health will continue to be one of the key areas in HKO’s future research. Some on-going research studies include seasonal variation of influenza activities and prediction approach, the impact of cold weather and wind chill effect on public health and related warning strategies, and spatial analysis of the impact of extremely hot weather on public health. HKO will also explore collaboration opportunity with medical community and other stakeholders to further enhance the healthcare research and services in Hong Kong using Big Data approach. Under the relentless pace of population growth and urban development, weather and climate services in Hong Kong have been evolving continuously with an increasing focus on the delivery of tailored information to meet the needs of the public, special users, and various sectors in the community. For weather and climate services, HKO has been conducting meteorological observations in Hong Kong since 1884. 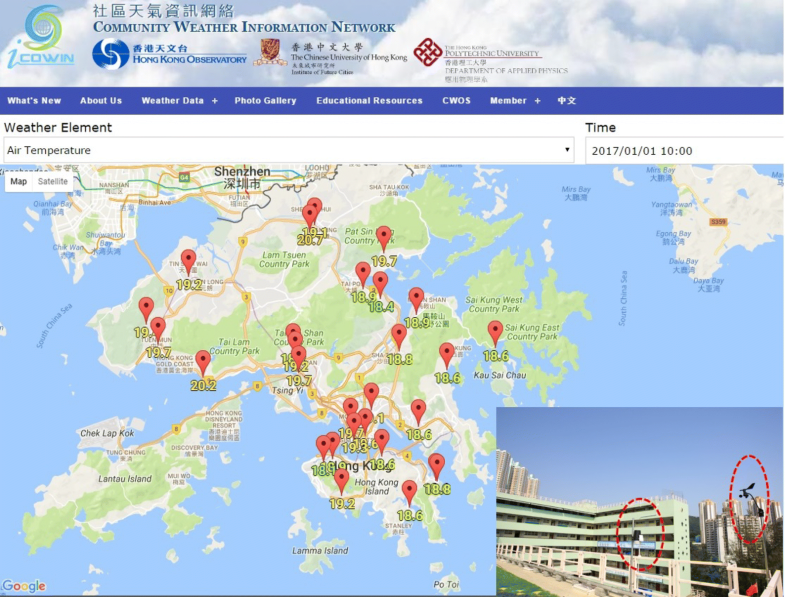 The introduction of the AWS network of HKO and the rain-gauge networks of DSD and GEO since the mid-1980s, as well as the Co-WIN network in 2007, has significantly enhanced the spatial and temporal resolution of weather monitoring in Hong Kong and extended the practices of meteorological observations to the school and community levels. Moreover, regular upper air soundings and the increasing availability of various high-resolution remote-sensing observations enable the monitoring of meteorological parameters beyond the near-surface levels through the depth of the atmosphere. By integrating weather observations and numerical weather prediction products, HKO is now able to provide a whole range of forecasts and services covering multi-time scales and issue warnings and advisories for various weather hazards (Fig. 10). The utilization of state-of-the-art communication technology also allows members of the public to readily access the latest warnings and advisories as well as weather information and forecasts at their locations through the highly popular HKO webpages and mobile app. In addition to information for public consumption, weather services and products are tailored in support of weather-sensitive operations such as those provided to users in the aviation and marine communities. In the process of such diversified development, HKO has successfully cultivated close partnerships with various stakeholders to enhance its weather and climate services by embracing the spirit of the Big Data concept in recent years, in particular in areas related to disaster risk reduction, energy, water, and health under the priority areas of the GFCS of WMO. development of impact-based and risk-based public weather services in collaboration with relevant government departments and weather-sensitive stakeholders. The paper is a collaborative work between the three authors. TL contributed to the content on climate related services and overall coordination. WW prepared the part related to the weather forecasting services and NWP development. KT contributed to the weather observations and Co-WIN aspects. All authors read and approved the final manuscript. The authors would like to thank Mr. C. M. Cheng and Mr. Edwin S. T. Lai for their valuable comments to the manuscript.